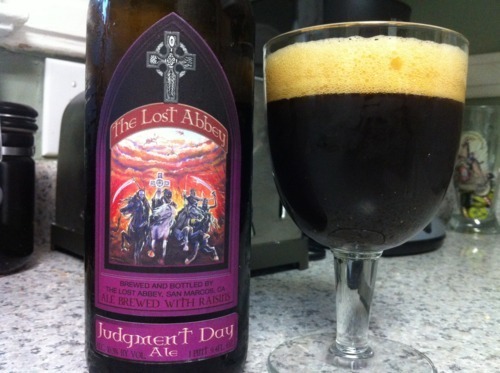 The Lost Abbey Judgment Day | Drink. Blog. Repeat. My fiancee and I celebrated our two-year (dating) anniversary this past Monday with a nice surf and turf dinner with roasted potatoes. I wanted to dip into the cellar and grab something I thought would work well with a meal, and a Belgian quad seemed to be a good fit. Having only tried a few beers from The Lost Abbey in the past and not being very familiar with them – aside from the fact they specialize in Belgian-style beers – I tend to just grab a couple random offerings and see what works. A recent trip to Atlanta yielded a bottle of Judgment Day, a quad (or strong ale, depending on who you ask) brewed with raisins. They have yet to disappoint and this definitely continued that trend. It starts with that classic quad appearance: Deep ruby color, almost brown with dark purple tint. There’s a pillow of a brownish head on top, about a finger’s length, and it sticks around for a long time..
On the nose are hints of a ton of things: molasses, plum, raisins, banana and fig. It’s kind of a subdued smell, but you can tell it’s just really rich and complex. The first thing you get on the mouth is a strong hit of carbonation with a real slight slight bitterness. That carbonation continues throughout the mouth. It’s like Scrubbing Bubbles on your palate, and you can feel it washing over everything. Those really rich, sugary flavors come through as well. There’s plum, molassas and raisins. On the back is a big of tartness which is cut nicely by the sweetness of the raisins. It’s a really big, complex beer, but one that’s still surprisingly drinkable.